Victims and those who commit the crimes against them are directly related. You cannot have one without the other and are dependant on each other to be. Sartre’s discussion on the concepts of freedom, oppression, and human nature will help explain and supplement much of this concept, but the tortured and torturer will give them a new light. Anyone who has ever been tortured would argue that the gruesome acts done to them restrained them that would not allow them to be free. The physical state of being is definitely potentially a state of freedom that might have been subdued, but Sartre would argue that every being has the capability to recognize their freedom in all situations. “Therefore this suffering can not be in itself a motive for his acts. Quite the contrary, it is after he has formed the project of changing the situation that it will appear intolerable to him.” (B&N pg 562) This freedom is always present regardless of your physical state of being. The torturer can not invade the mind of the tortured unless the tortured chooses. Separation of the mind from the body is something that Sartre utilizes in justification that freedom is something that each person must possess in order to retain the for-itself. Those who have been tortured would also disagree that they created the torturer. This perspective can definitely be understood as they had no direct relationship with the person. On the contrary, Sartre would argue this creation of the torturer occurs long before and escalates up to the point that the torture occurs. “Exploitation makes the exploiter dependent on the exploited… this dependence is at the heart of racism.” (Victory pg 75) Without some sort of conflict between the two to initiate the situation, neither the torturer nor the tortured could become who they do. This leads us to the how the torturer becomes this vile creation. It is often said by the torturers that they do not know why they did what they did. Often times the torturers are declared by those who know them as acting completely out of their normal range of self when these incidents occur. But this is not to say they did not do these acts or to excuse their actions. This Sartre would explain as being part of an attempt to exert freedom. “The perpetrators… would like to convince themselves and their victims of their total dominance: at times they are super-humans who have people at their mercy, and at times they are strict and strong men who have been give in the task of taming the most obscene, the most ferocious, the most cowardly of animals: the human animal.” (Victory pg 67) The mind set of what occurs with those who are acting as torturers is that they are compelled to do such violent acts out of doing what is best for those whom the tortured are a threat to. Torturers are often victims of older torture against themselves that these events now offer an outlet to exert their freedom; or offers a feeling that allows them a chance to regain their lost freedom and they make a project to do so. “The sadist discovers that it was that freedom which he wished to enslave, and realizes the futility of his efforts.”(B & N pg 527) This freedom is sought after and is the object which everyone desires to regain when they loose it. In the end the torturer feels no satisfaction in the torture because he realizes he can not enslave someone else’s freedom in order to regain his own. This is not to say the tortured themselves are the threat but the class of people they are a member of, be it religious, racial or social standing based. Those who have been tortured often feel that the victimization has unjustly occurred. 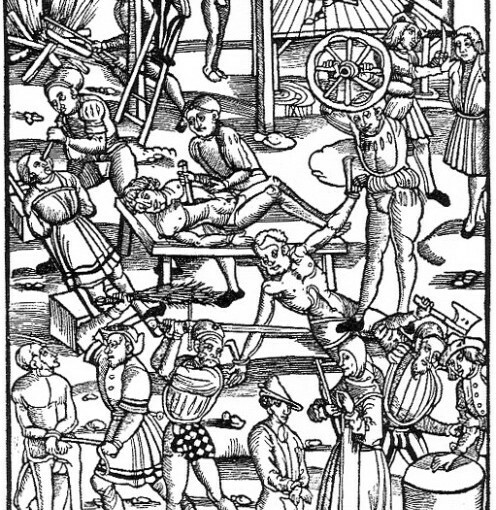 These events are not disputed as that the topic of torture is wrong but the events that lead up to the situation that occurred were just as immoral. The two suffer torment together, be it the physical gruesome that the tortured often goes through or the mental anguish of the acts being done to someone by the hands of the torturer. The torturer has been convinced in his mind that there are secrets in this person and there sole objective has become to save others by extracting these secrets. “Useless violence: whether the victim talks or dies beneath the blows, the vast secret is elsewhere, always elsewhere, out of reach.” (Victory pg 73) The violence done by the torturer and taken by the tortured is futile, but at the time seems needed by the torturer based on the violence around them. The events that occur between a tortured and the torturer are unpleasant for all involved, but Sartre sums it up well. “What is the use of troubling the conscience of the torturers? If one of them faltered, his superiors would replace him: there are plenty more where they came from.” (Victory 77) So despite the fact you always have you freedom, if it is used to extract a morality of those who are around you, you can not guarantee your project will be successful. Sartre, Jean-Paul. Being and Nothingness. New York: Washington Square Press, 1956. —. “A Victory.” Colonialism and Neocolonialism. 2001: 65-77.